A double chin is one of the most frustrating facial features a person can deal with. A double chin, also known as submental fullness, is that patch of fat and skin that can appear underneath the chin. Most people who have a double chin do not like how it makes their face look. A double chin can make men and women alike look older and more overweight than they really are. It can disrupt facial harmony and make an otherwise young and attractive looking face look different. A double chin can develop because of weight gain, aging, or just plain genetics, and if you have one, then you know what it’s like to steer clear of pictures or constantly want to hide your neck. If you’re tired of having to hide your double chin in pictures, and if you’re tired of having your beautiful face obscured by a double chin, you may want to consider Kybella®, the first prescription medicine designed to eliminate the double chin. Kybella® is nonsurgical and an injectable, so patients can achieve a sleeker, more alluring jawline without a painful or long recovery. Better yet, Kybella®’s results are permanent, so patients can enjoy their chiseled new profile for years. Kybella® takes minutes to perform, but it’s satisfying results can last a lifetime. With Kybella®, our patients can treat moderate to severe double chins without a single suture or incision, which is optimal for patients who want to avoid surgery or who aren’t candidates for a surgical procedure. Kybella® is also delivered using a very small needle, so the treatment is relatively painless. To make the treatment even more comfortable, we can help numb the treatment area with an anesthetic. Over 20 clinical trials with thousands of patients have shown Kybella® is not only incredibly safe but also effective. Dr. Vuich is also a skilled, experienced injector. She can deliver Kybella® with artistry while providing a comfortable, effective treatment. Almost anybody can be a candidate for Kybella®. 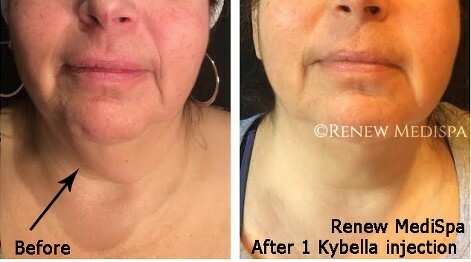 The ideal candidate for Kybella® is someone who has a prominent submental fat pad and wants to permanently eliminate the double chin without the need for surgery. If there is a secondary problem of loose skin in the region also, this may require another type of procedure after the fat pad has been reduced. Kybella® is the very first FDA-approved prescription medication designed to eliminate the double chin. It’s composed of a substance called deoxycholic acid, a non-human and non-animal formulation that can also be found in the human body. Deoxycholic acid is a natural substance, and it’s a crucial element for metabolizing fat in the body. The submental area is the area under the chin, and when Kybella® is injected into the submental area, it dissolves the excess fat cells that cause the appearance of the double chin. Gradually, the cellular debris from the destroyed cells is flushed from the body and a new jawline appearance emerges. Your Kybella® treatment takes less than a half an hour to complete, and it can be performed right in our medical offices. Before your Kybella® treatment, Dr. Vuich will analyze your submental area to determine where to place each injection. After marking the area, your Kybella® treatment will be delivered using an incredibly fine needle. 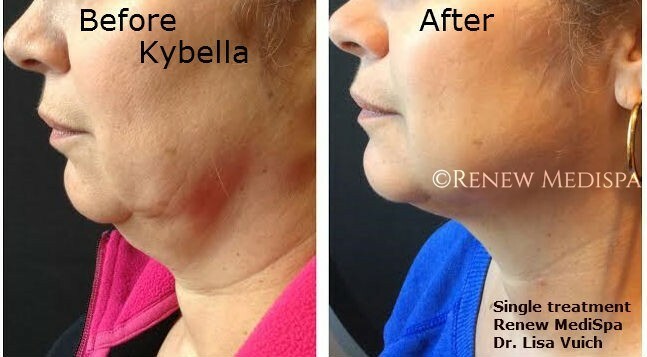 At Renew MediSpa we routinely numb the area first to make your Kybella® treatment more comfortable. Dr. Vuich will customize your KYBELLA™ treatment regimen, including how many treatments you need, based on your anatomy. Many patients experience visible contouring of their chin profile in 2-4 treatment sessions. Dr. Vuich recommends waiting 5 to 6 weeks in between treatments. While results might be visible after one treatment, many of our patients undergo an average of 2-4 treatments. Kybella® is generally dosed by the “vial”. 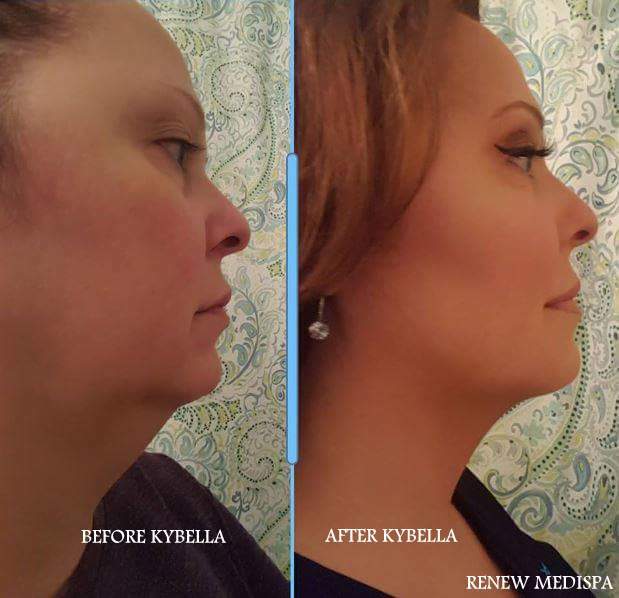 A single vial of Kybella® contains 2 ml of product. There is a set protocol for delivery of the product based on the anatomic size of the area to be treated. It is not uncommon for a full treatment course to utilize 10 to 16 ml. Therefore, over the course of your injection sessions, expect to use on average 5 to 8 vials. At Renew MediSpa, we can also combine Kybella® treatments with a TruSculpt 3D session to further enhance the result for some patients. This is especially useful if there is a secondary problem of loose skin in the area in addition to the fat pad. Sometimes we start with a session or two of Kybella®, and finish it off with TruSculpt 3D rather than re-injecting. Although it is completely nonsurgical, patients do experience side effects like soreness, redness, and swelling after the Kybella® injection. This is most prominent with the first session of Kybella®, but less noticeable with subsequent sessions if they are needed. With Kybella®’s innovative treatment, you can achieve the profile of your dreams. If you want your treatment delivered by an experienced, professional injector, contact Renew MediSpa now for a consultation. At Renew MediSpa we offer several treatments which can address the double chin: Kybella®, TruSculpt 3D and Profound RF. All three produce permanent fat cell destruction. The decision as to which procedure is best for you can be made during the time of your consultation. We can help you evaluate the options with your goals and your anatomy in mind, creating a solution that is customized to you- your goals, your lifestyle, your tolerance for “downtime”, and your personal preferences. 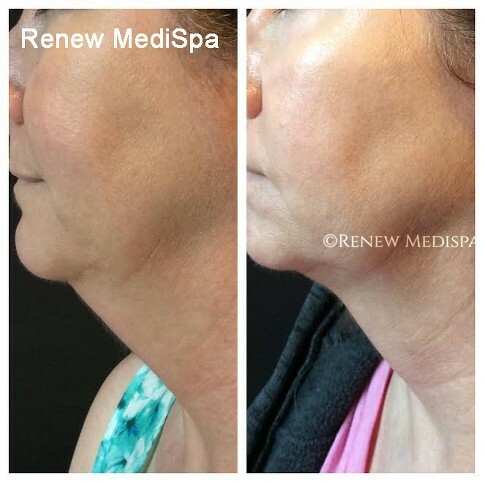 Customized treatment solutions are our specialty at Renew MediSpa, and we enjoy helping you navigate your options to make the best decision for you. If you’re interested in learning more about Kybella®, call us today to schedule your appointment.